Gru (Steve Carrell) is an evil villain, but an evil villain is only as respected as his last act of evilness. So when a new villain, Vector (Jason Segal) comes on the scene, Gru, his side-kick, Dr Nefario (Russell Brand), and his minions need to step up big time. Excellent cast, good story, some reasonable female characters (still not enough, animated film makers, come on), I really should have loved it a lot more than I did. I’d been told by a lot of people that I’d really like it, but it just seemed a bit samey to me. Funny, yes. Cute, definitely. Well conceived, sure. So what didn’t work? I just can’t put my finger on it. Perhaps I am just a bit over the bad guy who ends up not being the bad guy? (Although I loved the bedside stories). I’d be concerned it was being over animated films, but I really enjoyed Frozen just recently. It’s not you, Despicable Me, it’s me. You’ll find someone who loves you for who you are. Just not me. 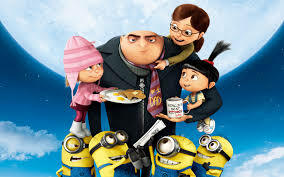 Despicable Me was nominated for both a Golden Globe and a BAFTA for Best Animated Film.